A version of this article appears in print on Page A18 with the headline: Confusion and Controversy Swirl, But the President Remains Positive. Other than a few comments that this is the 3rd shutdown in recent years, news coverage ignores the fact that Schumer and the Senate Democrats “shutdown” the government in January, 2018 when they staged a filibuster over another funding Bill because it didn’t protect DACA. You don’t have to wonder how Not-the-Majority-Leader Chuck really feels. And it’s clear that he has “reliable allies” at the NYT. But my experience has been different: a lot of Europeans think Donald Trump is right about border security and limiting immigration. And we’ve heard this from citizens of England and Italy, who go out of their way to express their support of President Trump. Last month, a British couple stopped to admire our narrowboat on the Thames. When they found out we were Americans, they turned the conversation to politics, support for Brexit and praise for President Trump. I deferred answering to Larry and braced myself for criticism or ridicule of the President from our new aquaintance. Instead, our Roman friend volunteered his approval of Donald Trump and the “changes’ both our countries are making in response to international pressure to accept overwhelming numbers of refugees. He talked about the inability to vet the refugees picked up at sea, the effects on Italy’s employment situation, and the financial stress the boat loads of immigrants were causing Italy before his government’s recent refusal to accept ships full of migrants at Italian ports. None of the people we talked to – or who made it a point to talk to us – expressed hate or racism. They are worried about the future if their countries and disapprove of “Brussels” forcing regulations on them, not simply afraid of foreigners. A month ago, one week after Irma, I came into Beef Island as volunteer doctor with a small medical relief group on a charter plane. I was only given a visa for 30 days, even though I explained that I have a Non-Belonger Land Holder License (NBLHL), but didn’t have it with me when I canceled the rest of our vacation in Europe. Today I went to the government offices in Spanish Town with my NBLHL and was refused a visa extension until I could produce a return ticket. The officer informed me that the NBLHL only allowed me 6 months “per annum” and proceeded to examine my passport, as though to check how long I had been present in the Country this year. When I came in on September 14, there was no demand for a return ticket. At the time, there was a perceived shortage of doctors and we believed I would need to be self-sufficient for food and water as I wouldn’t have access to power or running water. The prisoners and looters were still at large. Thank goodness, nothing was quite as bad as we feared: The British military had arrived by then; the wonderful people at Nanny Cay took great care of me and the rest of the group and we arrived the first day that Nanny Cay was able to turn on their desalination plant /water maker for a few hours. The medical need on Tortola was already improving enough that I was able to come to Virgin Gorda just 4 days later. Although they don’t need me either, I’ve been working at the clinic in Spanish Town at least two days a week ever since. I don’t want a job and don’t need the experience, but feel that I made a contract that I must keep. I also want the docs, nurses, and staff to know me if one of the feared medical crises does arise. BTW, That NBLHL I mentioned “authorizes” immigration “to grant leave to land for a period not exceeding six months…” Not “per annum,” and there is no mention of a return ticket six months in advance. Larry and I have also applied for a “permit to reside” which required the same documentation that we submitted – and resubmitted after it was lost – for our NBLHL: letters from law enforcement and character references, and financial statements. We were required to leave the Country while it was processed, but have been informed that it languished in the Immigration department without action from 5 July to September 4 – 2 months before Hurricane Irma – and that it is most likely lost and will need to be resubmitted. 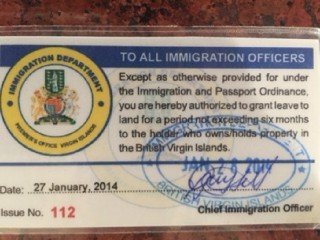 If you saw my post last week, you’ll recall that when Larry was finally able to come to the BVI 3 weeks after I did, he was required to pay duty or produce receipts at Beef Island Customs on the items (water filters, etc.) he brought, in spite of the moratorium. Beyond investing in our home at Nail Bay on Virgin Gorda, Larry and I have done what we could to assist physically and financially in the BVI recovery after Irma. I’m not as enthusiastic about residency as I was in June or even a month ago, and do not feel at all welcomed by the BVI.